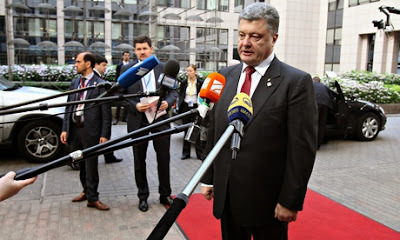 BRUSSELS, Belgium -- The prospect of further western sanctions against Russia over Ukraine has grown after the Ukrainian president, Petro Poroshenko, accused Moscow of doing nothing to end the "disastrous war" in the east of his country. Ukrainian president, Petro Poroshenko, talks to the media at the European Union summit in Brussels. In an interview with the Guardian and four other European newspapers on Friday, Poroshenko said separatists in Donetsk and Luhansk regions had carried out "more than 150 attacks" against government troops since a ceasefire began on 20 June. Five more Ukrainian soldiers died on Friday, he said. Speaking in fluent English in Brussels, Poroshenko stated bluntly that the rebels were under the control of Vladimir Putin's Kremlin. "I think now Russia has done nothing [to end the violence]," he said. "Russia is the leader of these banned groups. We are talking of Russian citizens, Russian officers, Russian soldiers of fortune." He characterised the Kremlin's strategy in Ukraine as "not very pragmatic" and "very emotional". While Poroshenko signed the outstanding chapters of a historic association agreement with the EU, pro-Russian and pro-Ukrainian sides in Donetsk announced that they had extended a ceasefire for three days to allow talks to continue. The Brussels deal brings Ukraine significantly closer to European markets and the EU – though with no prospect of eventual membership. Russia warned that the move would have "grave consequences". One Putin adviser, Sergei Glazyev, called Poroshenko a "Nazi". Poroshenko told the Guardian that Ukraine had paid "a very high price" for its pro-European choice. "We want to modernise my country. We want to introduce freedom, democracy and European values. Somebody doesn't like that. Someone attacks us for that," he lamented. Last November, Ukraine's then president Viktor Yanukovych refused to sign the EU agreement, instead accepting a bailout from Moscow. This triggered mass street protests, which led to Yanukovych fleeing the country and to Russia's invasion and annexation of Crimea. Asked whether Ukraine would get Crimea back during his presidential term, a smiling Poroshenko said: "Certainly". He did not reveal how this might happen. Poroshenko called Friday's signing ceremony, performed in the cavernous European council building in Brussels, the most important day for his country since independence from the crumbling Soviet Union back in 1991. Symbolically he inked the agreement with the same black pen that Yanukovych was supposed to use at a summit in Vilnius last year. "It is with me!" he said, showing the pen afterwards to the Guardian. Poroshenko said that he had discussed his 15-point peace plan for Ukraine at length with EU leaders, including Angela Merkel, François Hollande and David Cameron. He said the EU was "completely united" in its support for his country, which faced a grave security crisis. "That is why I'm happy. They spoke with one voice," he told the Guardian. The European council – representing EU leaders – will decide on Monday whether to impose new "targeted measures" against the Russian Federation, Poroshenko said. This is likely to mean additional sanctions against the Russian economy, in areas such as energy, finance and defense. EU states are divided as to how far these so-called "level three" sanctions, in preparation since March, should go. Poroshenko said his peace plan envisages a series of concrete steps. They include a ceasefire verified by European monitors, "including a Russian officer"; the return of three border checkpoints to Ukrainian forces; the release of all hostages seized by separatists; and the launch of "substantial" peace talks. Four Organisation for Security and Co-operation in Europe monitors were freed on Friday, but separatists were still holding 180 prisoners, Poroshenko said, including eight captured on Thursday. Poroshenko said it was now up to Russia to decide whether to back his plan. Putin's only positive step so far, he said, had been to withdraw this week a threat to use military force. Poroshenko said it was clear Russia had intended to destabilise Ukraine from the beginning. He said he had done his best to persuade Russia's president to sign up to a peace deal when he met him in Normandy, together with Merkel and Hollande, days before his inauguration. His goal was to make Russia "a predictable partner", he added. Poroshenko admitted that the situation in parts of the east of the country was a "real disaster". He said: "Half of Donetsk province and one third of Luhansk province is a zone of war." "There are no banks open. No pensions are being paid. There is no water, electricity. Lots of people with weapons are on the streets. People are afraid to go outside." He said that in areas controlled by Kiev – some 87% of the country – by contrast, life was entirely calm. "Within 2km from our checkpoints it's normal life. It's peace. It's calm." Poroshenko conceded that it was impossible to win back the east using military force alone. His strategy had other components, he said. It included constitutional changes to decentralise power, guarantees for Russian speakers, and the rebuilding of houses and other infrastructure damaged by fighting from state funds. He also wanted to create jobs and renew traditional industries. All this was impossible to do, he recognised, while "there was a war going on" and with rebels in control of key towns. At one point Kiev lost control of 280km (174mi) of its border with Russia, he said. He said a "significant part" was now back under "our control" but that "many tanks and artillery systems" had already crossed from Russia. These were now in separatist hands, he added. Looking pained, Poroshenko talked of the price his country was paying to try and defend its unity and integrity. "If every day Ukraine pays with several lives of Ukrainian soldiers, with several injured, this is not a peace plan. This is not a ceasefire. We just block the operation of our army and they do what they want."